Publicity material for Vadim Gluzman's Wigmore Hall debut stated that 'Vadim Gluzman harkens back to the Golden Age of violinists of the 19th and 20th centuries in technique and sensibility, while possessing the passion and energy of the 21st century'. Although it is not entirely clear how passion and energy of the current century differ from those in earlier centuries, without doubt Gluzman belongs to the great violinists of any age. I heard him several times under various conditions: these included concerto performances in a minor Budapest concert venue as well as in the Royal Festival Hall, CD recordings, and broadcasts. I should declare at the outset that – after these encounters – I have been favourably disposed to Gluzman's quality; enough to organise a group of twenty children (from age 4 to 12) and twenty-one adults to attend his Wigmore Hall debut. Gluzman did not disappoint. Leclair's Violin Sonata in D, Op. 9 No. 3 is not an easy warm-up piece for the violinist although it is an excellent overture for putting the audience into listening mode. With its dotted rhythms and powerful double stops on the violin, the opening Andante movement grabs the attention. In spite of considerable (and, I hasten to add, perfectly executed) technical demands, Gluzman delivered the intricate polyphonic lines with sensitivity and transparency. The robust contrasts in the second (Allegro) movement were treated with assurance and humour, while the third movement (Sarabanda) produced beautiful cantilena violin playing with well matched agogics (rubato within the bar) in the piano part. Gluzman observed the bowing style of baroque performance practice with taste; his gentle decorative additions – that is, trills – were delightful. The final movement (Tambourin) was spirited and gave the impression of a robust orchestral dance. Beethoven's Op. 47 'Kreutzer' sonata provided the most substantial work in the programme. Gluzman's sustained melodic line in the opening solo violin chords was well matched by Angela Yoffe's response in the piano part; thus the musical chemistry of the husband-wife duo was evident from the start and was maintained with admirable ensemble work throughout. Gluzman’s breathtaking virtuosity supported the musical structure; the theme was ever present in the variations of the second movement. The final movement could have served as a master class for presenting a musical dialogue (between violin and piano) in a very fast tempo (Presto) but also for bowing technique: Gluzman's use of the upper half (as well as the heel) of the bow aided the transparency of the contrasting motives. Ravel's Kaddisch – the Jewish prayer for the dead – from his Deux Mélodies Hébraïques [Two Hebrew Melodies] received a passionate and authentic performance. The other Ravel piece, Tzigane, dazzled all of us: Gluzman made the incredibly difficult violin passages sound as if they were easy and great fun to play. The sold out Wigmore Hall audience greatly appreciated Gluzman's well chosen programme and its high standard of delivery. The children in my group were exhausted – there was no interval during the 65 minutes concert – but excited. Admittedly, some of them liked meeting Gluzman and Yoffe (backstage after the concert) the best. This meeting was also skilfully and tastefully handled by the duo. They did not talk down to the children; they did not play the part of the great artists (which they are). They focused on this matter as they focused on musical matters: with wisdom and natural communication. Several of the children obliged with their own reviews of the event. Some of their comments are enlightening. 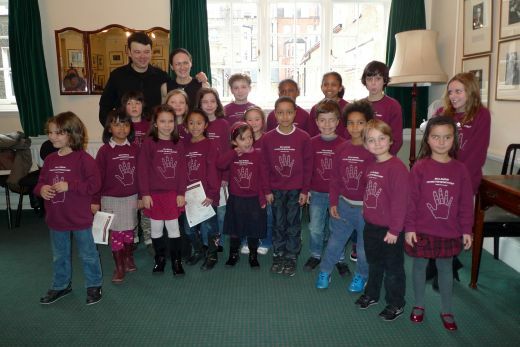 Photo: Vadim Gluzman and Angela Yoffe with 20 happy school children!